I was in the mood to bake, but wanted to make something easy so I decided to give this recipe a whirl. I followed other reviewers’ advice and added vanilla as well as more peanut butter, but I just don’t get all the rave reviews. To me, these were good, but nothing special. Then again, I’m not a huge peanut butter cookie fan and the real test will be when I bring the cookies into the office tomorrow. Also, I noticed the tops of most of the cookies look cracked, and the nice criss-cross pattern didn’t show. I’m thinking it may be because I made the cookies smaller (and therefore flatter), but really, I have no clue. Any ideas? Photos of the process here. Cream together butter, peanut butter and sugars. Beat in eggs and vanilla. In a separate bowl, sift together flour, baking powder, baking soda, and salt. Stir into batter. Put batter in refrigerator for 1 hour. Roll into 1 inch balls, (optional–roll in sugar), and put on baking sheets. Flatten each ball with a fork, making a criss-cross pattern. Bake in a preheated 375 degrees F oven for about 10 minutes or until cookies begin to brown. Do not over-bake. Makes about four dozen cookies. I didn’t have any crunchy peanut butter at home so I used creamy. I rolled some of the cookies in sugar after shaping them into balls. I used a small cookie scoop so I got way more than four dozen cookies. Original recipe from All Recipes. The cracking is most likely because your heat was too high. As for the criss cross, if you roll them into balls, then use a sugared fork – the pattern should show up better. Jenn, thanks! I thought that 375 seemed high, but considering I know nothing scientific about baking, I figured the recipe must be correct. Live and learn! I am not a big pb cookie fan either. I tried a recipe last month from Gourmet that was the best I had tried so far. I think your cookies look great! Are you using natural or hydrogenated peanut butter? I have a similar recipe, with mostly similar amounts, except it calls for 3 cups of flour and no baking powder. Folks enjoy them because they are not too sweet. Just a thought, but have you considered substituting new co-workers? do your icing recipes harden up of do they stay creamy? and if so, can one put them into gift pouches? 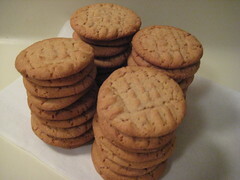 I am not a big peanut butter cookie fan myself either. However the recipe here (http://www.recchiuti.com/cgi-bin/recchiuti/recipes/recipe_2.html) is simple and delicious I have made it several times. I like how it’s flourless too. I thought I was the only person that is addicted to her Kitchenaid mixer, I absolutely love mine and use it almost everyday. I even had my husband buy me an extra mixing bowl for it for my birthday and he had it engraved with my name on it and they even had a birthday cake put on it. It was a great gift. You might want to check it out. I like using either raisins or (my fave is) dates. Also, a hint (1/2 tsp) of cinnamon. 325 oven is best for peanut butter cookies. Parchment paper is good. 10 minutes max.